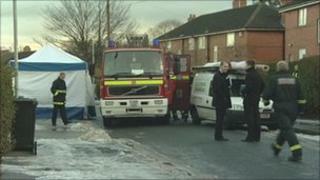 A man in his 70s has died in a house fire in Leeds, police have said. Another man, who is in his 40s, was injured in the fire at a property in Hollin Park Terrace, Fearnville, shortly after midday on Friday. He was taken to Leeds General Infirmary but the extent of his injuries is not yet known. West Yorkshire Police said they had cordoned off the property as they carried out an investigation to establish the cause of the fire.